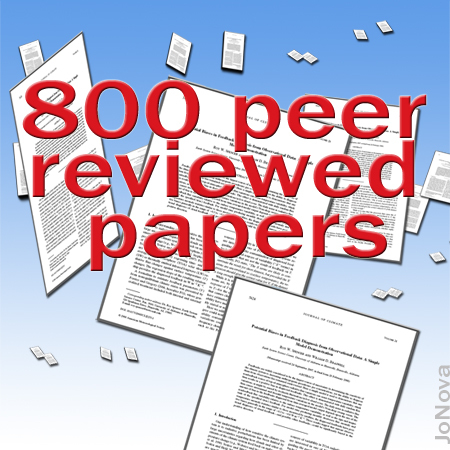 UPDATE: It’s now 900 peer reviewed papers. See PopTech for the additions and answers to all the common criticisms. Counting papers is not science, but it’s a hell of a way to show just how counterfeit the line is that “deniers” deny the evidence. The PopularTechnology list of peer reviewed papers is still growing and is up to 900 now. After thousands of sneering believers have ridiculed skeptics because “what-ever-you-say hasn’t been peer reviewed“, when they are given a list of hundreds of peer reviewed references, do they suddenly appear gracious, discover polite conversation and show an interest in the evidence? Not so. Instead, the sneer shifts gear, and attack the list of 800 papers because some of the papers are only a correction, an erratum, a submission (unpublished), a comment, an addendum, or a reply. And that’s a bluff too. Because if they had actually counted the list they’d know that there are a more items on the list than 800. The guys at PopularTech keep those not-peer-reviewed-but-valuable parts of the scientific conversation in the list, they just don’t count them. So this list is really 800 peer reviewed references plus other supporting material. Naomi Oreskes claimed that the consensus was so solid that 100% of the peer reviewed papers published supported the AGW hypothesis. She was wrong. (Thanks to Eddy’s comment). The number of peer reviewed papers doesn’t tell us about the climate around the Earth, but it tells us about the climate of politics-power-and-PR here on Earth. Half of the people at the party won’t even admit the other half have something to say. There are many ways to shut down conversations and stop people discussing “the evidence”. Calling them names is one. Then there’s bluster, bullying, and just repeating the same untruth ad nauseaum. in support of skepticism of AGW or the negative environmental or economic effects of AGW. For random trivia (and I do mean trivia), some of the names appear multiple times. Apologies to the greats I’ve left off this ad hoc collection. Idso = 72 (Both Sherwood and Craig), Lindzen = 22, Spencer = 6, Douglass = 14, McIntyre = 9. McKitrick = 17, de Freitas = 10, Carter 10, Michaels = 29, Soon = 23, Baliunas = 17, Pielke Jr 13, Pielke Sr 16. One point to draw from this are the Idso’s, who’ve been working for skeptical science, and fighting for empirical evidence since at least the mid seventies. Craig Idso runs CO2science, a fabulous resource for anything to do with the Medieval warm period, Co2′s effect on plant growth, and ocean acidification. The Idso’s deserve a loooong round of applause, and so do the guys at PopTech. This list is an excellent resource. “The inclusion of a paper in the Pop tech list does not imply a specific personal position to any of the authors”. Lets compile our favourite top ten papers? Rereke replies: I would take ten writs for theft of public money, made out in the names of the “top eight” players in the hockey team – plus the two nauseous Nobel Prize winners. Endorsement by friendly members of a Mutual Adoration Society is peer review. It does lack a lot of authenticity. To rise above the fray, it is necessary to not stoop to tactics that may be employed by either side to jade the issue. The facts stand on their own merit, no matter who supports or champions them. Adhering to scientific principles of discovery, elucidation and dissemination will (eventually) resolve the issue and demonstrate reality for all but the most obtuse to see clearly. Those pioneering individuals that stand up against the pressure and the pain are to be commended, no matter what their position, as long as they do so with integrity and rigor. Actually, the proponents of CAGW have claimed there isn’t any peer reviewed literature to support their claim that CAGW is nothing more than a falsified hypothesis. Naomi Oreskes claimed that the consensus was so solid that 100% of the peer reviewed papers published supported the AGW hypothesis. Seehttp://www.sciencemag.org/cgi/content/full/306/5702/1686/ She was wrong. The CAGW hypothesis has more holes in it than an Al Gore alibi. If you could only take ten papers to a debate with someone from the Big Scare Campaign, which ones would you take? I would take ten writs for theft of public money, made out in the names of the “top eight” players in the hockey team – plus the two nauseous Nobel Prize winners. Your peers aren’t as good as mine” For evidence see any posts that reference publishing in Energy and Environment (EE). For the Warmists it won’t matter! If the message is “no AGW” they won’t believe it. This means the message must be to the masses and politicians. Nah! Unless all of ‘em were reviewed either by Michael Mann or Phil Jones they ain’t no good! In an Australian context, with a carbon price imminent, do any of these peer reviewed papers tackle the question of the role of CO2 in the atmospheric temperature changing process (ideally from a perspective of the basic physics/chemistry of the energy exchange mechanisms in play)? If so then shouldn’t this information be put in the hands of our various politicians so they have the opportunity to reach properly informed decisions on the merits of a carbon price/ETS/CPRS? But I see the “experts” are leg tripping themselves lately. Tamino’s attempt to discredit Andrew Montford’s book ( The Hockey Stick Illusion ) has drawn heated debate , including attempts to rubbish Judith Curry , who has been trying to tell them on Real Climate to at least read the book as it raises important issues. Steve McIntyre outlines how they ( Schmitt and co.) have ended admitting that Mann did get it wrong with the Tiljander data. You make the assumption here that politicians make decisions based upon evidence-based policies rather than policy-based evidence. People hear what they want to hear just as scientists will find what they are paid to find. Given that the amount of money thrown at AGW in it’s various guises severely dwarfs money examining the counter case, it is to be expected that the number of peer reviewed papers supporting AGW dwarfs that which does not. But it only takes one finding to disprove a hypothesis… 100 confirming it doth not make it so. In that way science is on the side of the evidence, not the quantity of peer reviewed papers. But I digress… politicians are for the most part not interested in the facts, except when they support their political stance. Take the Australian experience for example. I expect that Tony Abbott, deep down, truly believes that CAGW is “crap”, to borrow his word. But he knows that he will lose the election if he comes out and says it loudly. So he puts aside the ETS concept and says he will tackle environmental issues directly with his “Green Army.” This is how politicians operate… they tell people whatever they think they want to hear, but far more importantly, they don’t tell people what they don’t want to hear. People are not ready to hear that the AGW belief system was largely “crap.” They would feel betrayed if they were aware of the truth, and in their anger they would even shoot the messenger… that is assuming the Greens didn’t lynch him first. Which just shows what a basket case climate ‘science’ actually is. Anyone who dares question the ‘consensus’ becomes a pariah. This is the kind of dogmatism to be expected from an 5th century religious order, not a 21st century scientific community. For my 2c: I think the claim of ‘no AGW’ is a mistake. The sceptic or realist argument should be ‘no catastrophic AGW’. That is where the warmist argument is devoid of evidence. Perhaps the most remarkable thing would be if these papers were NOT included in the IPCC reports. 2. That the IPCC is a political organisation with a predetermined agenda. I’ll leave it up to you to decide which one it is. That’s easy. The Intergovernmental Panel on Climate Change can be nothing other than political. I’m tending to option #2 as well, given that some of these papers have been around for more than 10 years and should have had plenty of time for consideration. It’s also a bit of a giveaway when the IPCC publishes its summary document for policy makers several months before the main body of the scientific report is finished. It’s almost as though they know exactly what the scientists are going to recommend!? Abbott was talking about the science of AGW. It’s unlikely that the voting public would take the time to grasp the subtlety. His policy on the AGW issue reflects your view that the voters are not ready for the defrocking of Gore and Co. However it is worthwhile to confront all colours of politicians with any peer reviewed material that addresses the real role of CO2 in the climate change process. My local apparatchik regularly hides behind the peer-review banner when confronted by John Nicol’s unfashionable greenhouse analysis. The following article giving a view / analysis of the current political situation on the AGW issue in the USA drew some “interesting” comments from the pro AGW crowd. Its almost as if they don’t want to be aware of the political realities. editor of Science at that time, and Kennedy had his own credibility problems when he was president of Stanford University. Reading anything by Oreskes is, a priori, a waste of time. Peer-review system must be scrapped if ethical and true science is to move forward. The current system needs an expert in the field to approve the science but any new science then cannot be reviewed as who are the experts? To turn down science due to protecting the current system and the current “old boys”, is just creating more educated idiots to replace the current ones. If the current scientists do not know the true basic mechanics of a circle, how can they understand the mechanics of a planet? Sir Jim, I don’t have a problem with your suggestion. However, amongst the skeptics there are some that still have a problem with the historical temperature records. I don’t like to concede anything to the Warmists. Because of that I’ll continue using AGW. Also, it wouldn’t matter if I said GW, AGW or CAGW. In the vernacular of a warmist “warming” of any kind is man caused and likely catastrophic. To the skeptic there is still room for a lot of interpretation. My grandfather (and Henry Ford) said if someone tells you they are an expert they are not. Thanks for the link to Forbes. Chief amongst the whiners was are old chum Spaerica. I could see in my minds eye the tears falling on her keyboard as she hammered away. And if you are one of those that truly believe that global warming is a hoax, and that you are at heart a true “skeptic,” then remember to pay attention to what continues to happen to the planet. The blogs and the desperation opinion pieces and the polar bear references and everything else, in the end, are irrelevant. What matters is what actually happens to the climate. What matters is the ever increasing tropospheric temperatures measured by satellites, and the shrinking summer ice extent measured by satellites, and the shrinking Greenland and Antarctic ice masses measured by satellites. Well, she is committed. On the other hand, perhaps she should be committed?! Yet ANOTHER GREEN CON by gillard and the communist federal labor government! Remember a vote for The Greens IS a vote for labor and a carbon tax based on FRAUD, which will only make the cost of living UNAFFORDABLE! Re: Bulldust, #10: “Evidence-based policy vs. policy-based evidence”. Brilliant phrasing. Mind if I poach it for correspondence with warmist politicians? Fire away Patrick… they are just words, but I probably got the idea eslewhere… not sure who to attribute. Because the scientific report was already largely finished. “largely finished” means that the conclusions weren’t written yet. The politicians at the IPCC wanted to write the “correct” conclusions and not depend on the scientists who might actually show some integrity. This has been reported by several authors, some of whom resigned from the IPCC and even asked that their names be removed as authors, because of the manipulation done by the political hacks who wrote the summary. AGW believers will just move the goalpost with absurd rationalizations.That is all they have left. They also prefer lobbing ad homonyms at the writers of the papers,rather than to find what is wrong with them.That is because they know they have nothing else to lob at us with that is rational. Naomi Oresked consensus claims are absurd,stupid and irrelevent.We know perfectly well there are a good number of accredited scientists who have spoken out against the AGW hypothesis early on.I recall Dr. Lindzen being disturbed about the AGW nonsense back in the late 1980′s.I recall Dr. Michaels arguments against the early Hansen modeling bromides in the early 1990′s. Sorry, but it is a matter of record that your assertion is wrong. We can be sure that the producers of the main report will ensure that it agrees with the Summary. I published an objection to this in Nature before the main report was completed (this was before Nature was usurped by Mann et al.). Joanne, thanks for posting this and believe it or not I wanted to say thanks to the alarmists as their rabid attacks on the list actually helped it involve into the much more bullet-proof version you see now. Anyone is free to copy the list, just source where it came from. Re: Bulldust, #10: “Evidence-based policy vs. policy-based evidence”. As an AGW skeptic, I am just THRILLED at this neat phrasing. I believe this applies to other campaigns that have assumed moral dimensions too. The most obvious were those of the late 90′s – the one against guns and the one against the lady fish and chip shop politician. The Liberal Party’s website has come up with one of the most horrific and dangerous ideas of the last 100 years – to allow hundreds of thousands of Australians to carry concealed loaded pistols and revolvers. We condemn Tony Abbott, his Attorney-General George Brandis, and the Shadow Parliamentary Secretary for Justice and Public Security, Mr Jason Wood MP. If ever a subservient attitude to the gun fanatics in our society has been envisaged, it is the Liberal Party’s sickening and shameful idea of allowing loaded pistols and revolvers to proliferate in our homes, our streets, our trams and trains, and our workplaces. It appears to us that this socially irresponsible idea of concealed carrying of handguns is being supported by the member for Latrobe, Mr Jason Wood MP. It is incredible that this man holds a position of such influence in the Liberal Party that he has responsibility for advising that party on ‘Justice and Public Security’. If ever the public had something to fear from an Abbott government it would be the presence of people like Mr Wood, who apparently support the ideas of gun fanatics. Gun Control Australia Inc has written to Mr Abbott, Mr Brandis and Mr Wood, complaining about the two entries that have appeared on the Liberal Party’s website, where, in one case the major weakening of our gun laws has been suggested, and in the second case, where allowing people to carry concealed loaded pistols and revolvers has been proposed. Apparently we can no longer trust Mr Abbott and the Liberal Party to protect the Australian public by giving support to the existing gun laws – which to John Howard’s credit was strongly supported by the pre-Abbott Liberal Party. Wake up Australians, the Liberal Party is paving the way to destroy our gun laws and turn this country into a gun mayhem like America, which has fifteen times the yearly rate of gun homicide as Australia. The campaigns of the Australian media follow this ‘moral status auction’ pattern described by Katharine Betts in ‘The Great Divide’. Our media is so homogeneously politically correct, and at the same time self-serving, that you wonder how a recto-cranial inversion could be so comprehensive! There was a time when AGW believers screamed hard and loud against such a list Poptech and Morano had posted in the past.They would bring out the ad homonyms and the “they are not scientists” or that “they are not climate researchers” and other evasive bromides.Some of it was TORTURED attacks indicating to me they simply can not accept the fact that their beliefs are flat wrong.So they go into withdrawal pains and block out rational thought. Now it is all quiet outside of certain blogs we know that exist to support the pseudoscience of AGW hypothesis.I think some of the reality is creeping in therefore they just stay away,to avoid the pain of their delusions. I had problems understanding the proposed concealed carry law. Will it require that a person carry a “pistol and a revolver” (as in at the same time)? That gets kind of heavy! PS One can easily search the web for accurate information about the USA states allowing “concealed carry”. In every case, that I am aware of, violent crime has been reduced when these laws permitting CC were put in place. Sorry Mark, I was just showing how moral rectitude is closely allied with recto-cranial inversion even though the chattering class as a whole use that issue to display their moral superiority. So… a knife murder victim is not as dead as a firearm murder victim? Mark, I say the same as I suspect you would on this issue. Mayhem is not the word I would have chosen. it may or may not include actions ruled as self-defense, actions for law enforcement, or the safe lawful use of firearms for sport, hunting, and target practice. Gun violence encompasses intentional crime characterized as homicide (although not all homicide is automatically a crime) and assault with a deadly weapon, as well as unintentional injury and death resulting from the misuse of firearms, sometimes by children and adolescents. Gun violence statistics also may include self-inflicted gunshot wounds (both suicide, attempted suicide and suicide/homicide combinations sometimes seen within families). I know this is way off topic but it speaks to a subject I feel is seriously important. The US Constitution Second Amendment is second only after free speech. When looking at the history of why gun ownership is protected by no less than the constitution, remember that self defense is the last resort of the people against tyranny. Some of the proposed governmental “Co2 control” is close to if not outright tyranny. I know this is for Australia but I don’t like to see any law abiding citizen disarmed. Yes, John Crook is a walking redefinition of the language to suit his own viewpoints. I have a paper from 1980-ish where he asserts a massive ‘problem of shooter legitimacy’ – he somehow redefines legitimacy to mean ‘complies with my prejudices’. I help out on the Wikipedia page ‘Gun politics in Australia’ so have seen a lot of his stuff over the years. WHere this issue is in common with climate politics is the level of shrieking media certainty that there is only one possible reason for disagreeing with them – moral turpitude. The cognitive traps are very effective – committment and consistency, self-serving bias, confirmatory bias; and projection and self-righteousness all work at every level of these ‘public debates’. Er, no. You have to get the temperature down first, then the CO2 will follow. The list has poor quality control and includes many papers that are not against AGW at all. Only by nearly a year – Good One! I gave you a tick for being silly! Maybe a lettuce leaf short of a sandwhich EH? Lie 7. The author of the paper may have subsequently admitted the science was flawed, but Poptech will continue to list the paper. Yep, my prediction came true. Poptech keeps posting a “rebuttal” to the wrong paper or you think Idso time travels. Which is it? It doesn’t predate it, it is published in the exact same issue. All the points in that critique were already addressed in the one I presented and does not change Dr. Idso’s argument. Blimey, try to keep up. I never said it was cited. I said it does not predate it as both were published in the same issue. All the points in that critique were already addressed in the one I presented and does not change Dr. Idso’s argument. Poptech, “All the points in that critique were already addressed in the one I presented”. So you say, without proof. Produce the full document, all the abstract shows is the first page. And yet you claimed that “All the points in that critique were already addressed in the one I presented”. Now you admit you’ve not even read the paper! So how is it you determine that Idso address their concerns if you’ve not even read it? Let me know when you can produce the full document as you clearly have not read it. You were the one claiming Idso rebutted all criticisms, in an Idso paper that doesn’t even cite Potter’s paper. Are you unable to read? I never said he cited that paper, I said all the points in that critique were already addressed in the one I presented and does not change Dr. Idso’s argument. Let me know when you can produce the full document. Yet how would you know that? What proof do you have? You now admit you’ve not even seen the full document yourself so how do you know all points were addressed? You are a poor reader. I suggest that you either up the quality of your replies.Or be accused of trolling. Just to clarify, since this has recently been brought up, I read the correspondence by Idso some time ago but do not have free access to that DB anymore and it is not freely available online so I cannot quote from it. Blimey has yet to produce Idso’s full paper or the other ones.